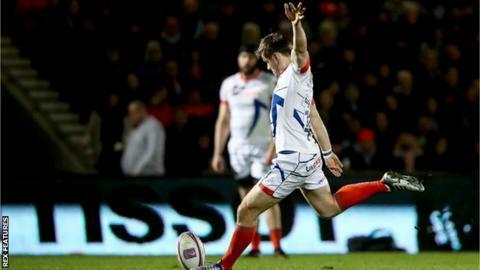 Fly-half AJ MacGinty kicked 12 points against former club Connacht to help Sale to a 20-10 victory in the quarter-finals of the European Challenge Cup. After an early penalty from Connacht's Jack Carty, the home side dominated the first half - Byron McGuigan and Denny Solomona both scoring converted tries. MacGinty added a further two penalties to secure a 20-3 half-time lead. Despite plenty of pressure in the second period, the visitors managed only Kyle Godwin's converted score. Connacht failed to take proper advantage of the Sharks being down to 14 men when James Phillips was shown a yellow card for a no-arms tackle midway through the second half. Prior to that they had pushed hard during a relentless 15-minute spell, but could not find a way through Sale's rock hard defence. The foundation for that strong rearguard came in the early stages of the game, when Steve Diamond's side started superbly. Inspired by the fit-again MacGinty, they scored early as Cameron Redpath burst through the middle before an overlap sent Scotland wing McGuigan over in the corner. MacGinty added the extras from the touchline and he did the same when required again just a few minutes later. This time the try came from a superbly executed line-out with the ball eventually reaching England's Denny Solomona out wide, who touched down under no pressure. After MacGinty stretched the advantage from the tee, it proved too big a gap for Connacht to close despite a battling second-half showing. Sale fought hard in defence, summed up by the receipt of another yellow card in the closing stages - this time to Curtis Langdon for a poor tackle. Sale: L James; Solomona, S James, Janse van Rensburg, McGuigan; MacGinty, De Klerk; Harrison, Webber, Jones, Evans, Phillips, Ross (capt), T Curry, Beaumont. Replacements: Langdon, Bristow, Tarus, Strauss, B Curry, Cliff, Redpath, Reed. Sin Bin: Phillips (60), Langdon (79). Connacht: Leader; Adeolokun, Godwin, Aki, Kelleher; Carty, Marmion; McCabe, McCartney (capt), Robertson-McCoy, Cannon, Thornbury, Masterson, Connolly, Boyle. Replacements: Heffernan, Buckley, Bealham, Maksymiw, Copeland, Blade, Daly, Fitzgerald.